Retina has finally hit the iPad Mini, meaning at least resolution-wise, this little guy's packing a punch. And even though the 7-inch tablet market is not necessarily a crowded field, the competition that is there is running a tight race. Let's take a look at how the iPad Mini's specs measure up to the rest. First, though, our trusty disclaimer: Specs will never tell the entire story. We say this every time, but that's because it's true. Ideally, the whole will be greater than the sum of its parts, and the overall user experience really will depend on the individual. The most notable change here—at least in terms the new vs old iPad Mini—is that it finally comes with Apple's impressive-sounding Retina display. Which is great iPad Mini-wise! But as far as the rest of the competition goes, that doesn't mean its necessarily any better. 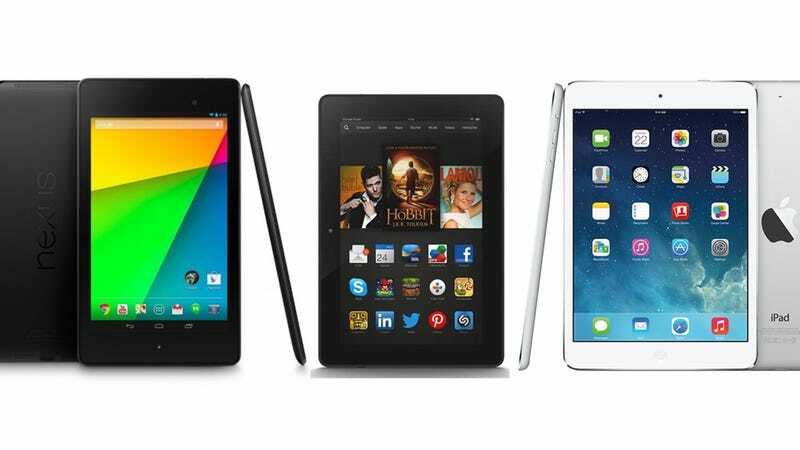 The iPad Mini beats the Nexus 7 and Kindle Fire HDX by a mere addition of 3 PPI. Camera-wise, too, all three tablets are running pretty much the same numbers both front and back-facing. The only real difference comes in the iPad Mini's thickness, which is a considerably thin .29 inches. But at a price point $100 more than any other tablet on the list, that approximately .05-inch loss doesn't quite seem worth it. A lot of it is about ecosystem, though, and you basically need to ask yourself if iOS 7 is worth the cost.